A year in review | hello, just trying to heal, here! I was quiet on the adoption front for years, silenced by fear of losing the thin thread of the only communication and access I had to my child. And then what I had hoped would be a floodgate opening when my son came to the age where he would be allowed to search for me brought nothing but silence, and the silence produced ever-increasing anxiety. After all, the adoptive parents’ obligation to write to me and tell me of his state, had run its course, and not another word came from them after his 18th birthday – which made me feel a little used and discarded, if I may be honest…and this is the first time I’ve said as much. Not to worry, though. I analyzed long ago that at least they didn’t skip out on their promises to keep me apprised while he was a minor child. That would have devastated me. The dropping off the face of the earth after he turned 18 thing just stung. I do recognize the difference. So in that 3-year period of no word whatsoever, all I had was his personal facebook page to peek at to know of his well-being. I didn’t dare send a friend request, and his privacy settings let me see very little but at least enough to know he was alive – accept for the times his page would be deleted for weeks and sometimes months at a time (did I say stress?). As the months and years passed, I started to believe that my child was one of the adoptees who would choose not to pursue learning of his origins. And in the process of finding a way to come to terms with that, I took to expressing – finally – my true feelings about relinquishing my child as a baby 5 days out of the womb and to advocating for more humane practices in adoption as well as advocating for adoptee rights. Then I was silenced again – in a good way. I heard from my son. It created a little bit of a predicament, it felt. I have been at odds ever since on how to proceed with my advocacy and writing going forward since this blessed event. I speak publicly whenever opportunities present themselves and hope I have at least left an impression on what it means to carry, give birth to, and relinquish a child to people one barely knows over the remainder of a lifetime. Other than that, I advocate but perhaps a little more quietly as still I see a great need for reform in adoption. And I will keep advocating in every way I can – and hope I do nothing to injure or alienate my own child as he is, after all, the single most important part of my life and existence. I have a small facebook page where I post all things I come across that are adoption related. In the interest of staying sane, I am not able to devote every day to research. Part of my survival is finding the person I am beyond adoption and concentrating on things that person is interested in pursuing. There are less than 40 “likes” to this facebook page, but the people who do read the content post and share on their own pages, so the word is still getting out – which is my only goal. It doesn’t matter to me how the word gets out, only that it gets out. With this year winding down and a new year about to emerge, I was starting to feel a little guilty about not doing as much lately, but then I looked at my facebook page, Freebairn Advocacy, and I realize I have been steadily posting a number of items each month of this year, and this is the year it all started for me. I have not been silent…just walking a very fine line I haven’t entirely found my footing to walk steadily and with as much certainty as I hope to walk in the days to come. To all of you who’ve been reading this blog and following on facebook, thank you for listening. Thank you for caring about this. Happy New Year!! May it be a year of many triumphs – no matter how small or great. Happy New Year my friend! May God’s blessings continue to rest upon you. Thanks Joe! Happy new year to you too! I’m happy for you that your son is in your life. My mother doesn’t want to hear anything bad about adoption. She knows how I feel hough, and it causes her so much pain that she can’t see me. “and hope I do nothing to injure or alienate my own child as he is, after all, the single most important part of my life and existence” I can’t imagine my mother ever feeling like you feel about your son! She tells me I have to get over it, just like she has by doing yoga and following “the .science of mind”. Bad feelings are not allowed. Keep loving your son! It’s the only thing he really needs from you. Happy, happy new year to you. Thank you so much for your good wishes and encouraging words. I am sorry that your relationship with your mom is difficult. We all have our survival strategies…unfortunately, when it comes to dealing with our choices as birthmothers, we don’t always pick healthy ones. 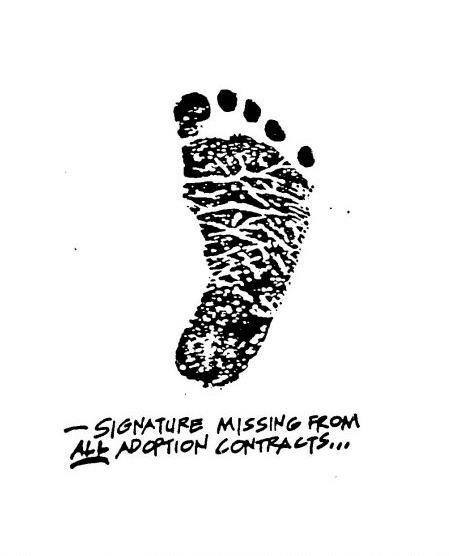 There’s no easy way to face the unconscionable truth of the consequences of giving a child up for adoption.